Halfway from Chora to Mylopotas down to a private road leading to a secluded beach you will find the luxury villa behind the gated entrance. 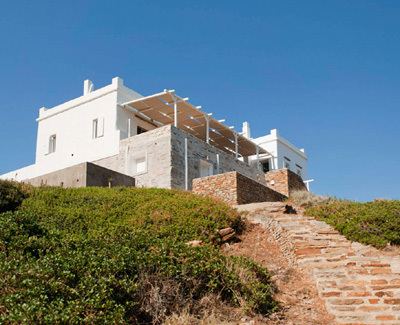 It is a two story villa built with stones that combines traditional architecture with contemporary minimal design. On the upper floor the white wooden ceiling maintains the Cycladic style of the house while the handmade ceramic tales ground you and give you the feeling of the earth. There is an open plan living area with a comfortable lounge space with fireplace, a massive wooden dining area and a high end full equipped corian kitchen. The stylish living area is a combination of Cycladic features and minimal design. On the upper floor there is an in depended master bedroom with double bed , satellite TV and ensuite bathroom with shower cabin. A second bedroom with double bed and a third one with twins are on the same floor sharing a bathroom with tub. There is also a guest WC with washing machine on the same floor. Large terraces with fantastic sea views are all around this beautiful house where you can enjoy al fresco outdoors dining or relax and gaze at the big blue. The upper floor is equipped with Clima A/C, satellite TV, DVD player, Wi Fi and a lap top. On the ground floor with separate entrance is a separate house with a cozy sitting area with fireplace, dining area, full equipped kitchen, bathroom with shower and double bedroom with double bed. The colorful floor is made of polished cement and the lively decoration gives a joyful atmosphere at this lovely house. Terraces with fantastic views keep you in touch with the sea and the sky .This house is equipped with A/C, Satellite Tv and wi fi. The big plus of the property is the secluded rocky beach that is 20 meters under the villa that is accessed through stone paved stairs. There is a second a beach 80 meters distance through a nature path.